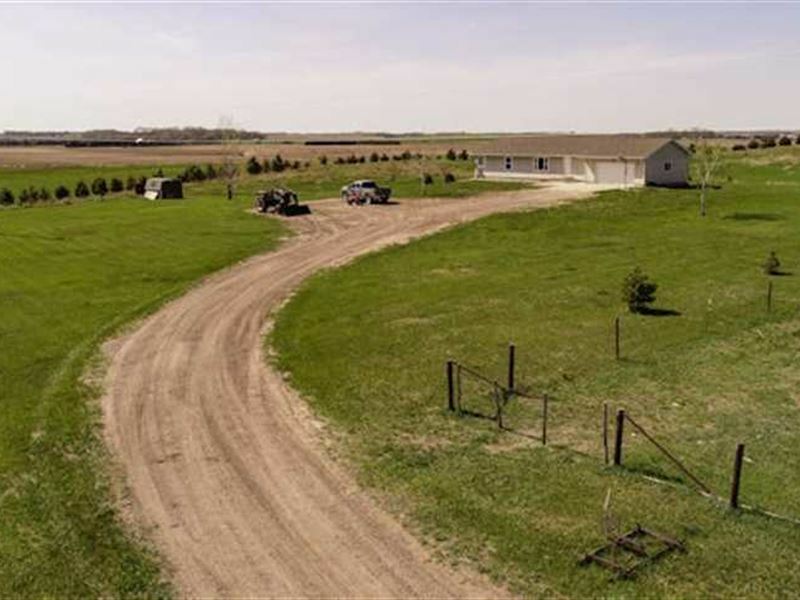 Acreage with 7.52 acres +/-, just mile south of Foster, NE. This acreage was constructed new in 2006. Approx. 1680 square ft living area on the main floor and 1680 square ft in the recently finished basement. This country home offers an open concept kitchen with island, dining area and living room. Master bedroom features a walk-in closet and a spacious bathroom with whirlpool tub. Guest bedroom, guest bathroom, office area with French doors and laundry room are all located conveniently on the main floor. Basement was just newly finished this year with a wide open living room, two bedrooms with egress windows and bathroom. Home also has a walk-out basement and two car heated garage. All electric utilities with heat pump, hot water heaters, and water softener. Newer well with outside hydrants for the livestock, established shelterbelts, all sitting on 7.52 acres +/-. Adjacent 59 acres +/- also available for purchase.